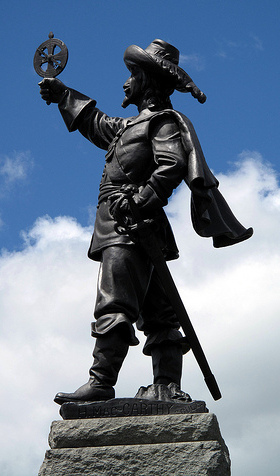 On or about this date in 1608, explorer Samuel de Champlain judged guilty and had executed for plotting his own murder a Norman locksmith among his host of men establishing the Quebec settlement. Though there were previous European forts on the site, Quebec City had been formally founded by Champlain just a month earlier, on July 3, and we here join the exposition of the public-domain Pioneers of France in the New World. Hanging judge: Samuel de Champlain monument in Ottawa. Creative Commons image from dugspr. They were pioneers of an advancing host, — advancing, it is true, with feeble and uncertain progress, — priests, soldiers, peasants, feudal scutcheons, royal insignia: not the Middle Age, but engendered of it by the stronger life of modern centralization, sharply stamped with a parental likeness, heir to parental weakness and parental force. 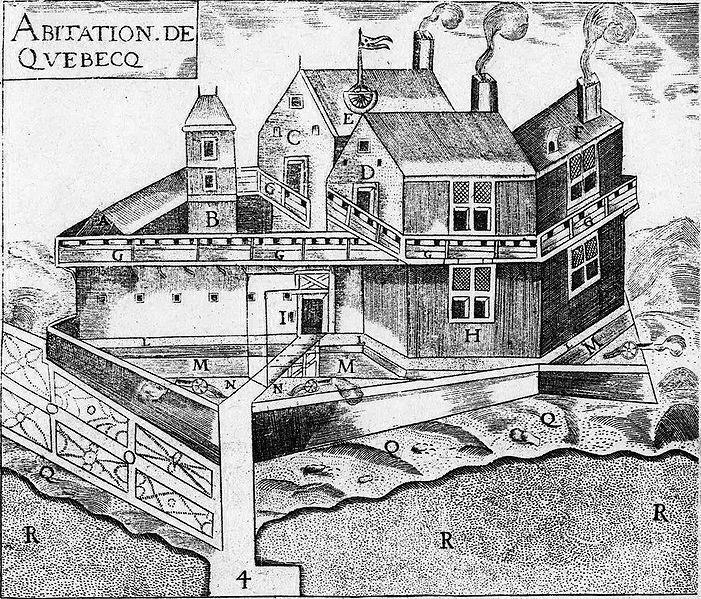 In a few weeks a pile of wooden buildings rose on the brink of the St. Lawrence, on or near the site of the market-place of the Lower Town of Quebec. The pencil of Champlain, always regardless of proportion and perspective, has preserved its likeness. A strong wooden wall, surmounted by a gallery loopholed for musketry, enclosed three buildings, containing quarters for himself and his men, together with a courtyard, from one side of which rose a tall dove-cot, like a belfry. A moat surrounded the whole, and two or three small cannon were planted on salient platforms towards the river. There was a large storehouse near at hand, and a part of the adjacent ground was laid out as a garden. In this garden Champlain was one morning directing his laborers, when Tetu, his pilot, approached him with an anxious countenance, and muttered a request to speak with him in private. Champlain assenting, they withdrew to the neighboring woods, when the pilot disburdened himself of his secret. One Antoine Natel, a locksmith, smitten by conscience or fear, had revealed to him a conspiracy to murder his commander and deliver Quebec into the hands of the Basques and Spaniards then at Tadoussac. Another locksmith, named Duval, was author of the plot, and, with the aid of three accomplices, had befooled or frightened nearly all the company into taking part in it. Each was assured that he should make his fortune, and all were mutually pledged to poniard the first betrayer of the secret. The critical point of their enterprise was the killing of Champlain. Some were for strangling him, some for raising a false alarm in the night and shooting him as he came out from his quarters. Having heard the pilot’s story, Champlain, remaining in the woods, desired his informant to find Antoine Natel, and bring him to the spot. Natel soon appeared, trembling with excitement and fear, and a close examination left no doubt of the truth of his statement. A small vessel, built by [Francois] Pontgrave at Tadoussac, had lately arrived, and orders were now given that it should anchor close at hand. On board was a young man in whom confidence could be placed. Champlain sent him two bottles of wine, with a direction to tell the four ringleaders that they had been given him by his Basque friends at Tadoussac, and to invite them to share the good cheer. They came aboard in the evening, and were seized and secured. “Voyla donc mes galants bien estonnez,” writes Champlain. It was ten o’clock, and most of the men on shore were asleep. They were wakened suddenly, and told of the discovery of the plot and the arrest of the ringleaders. Pardon was then promised them, and they were dismissed again to their beds, greatly relieved; for they had lived in trepidation, each fearing the other. Duval’s body, swinging from a gibbet, gave wholesome warning to those he had seduced; and his head was displayed on a pike, from the highest roof of the buildings, food for birds and a lesson in sedition. His three accomplices were carried by Pontgrave to France, where they made their atonement in the galleys. More about Champlain in this podcast, by the author of Champlain’s Dream: the Visionary Adventurer Who Made a New World in Canada.